Higher level thinking activity prompts that has students analyze parts of the book A Long Walk to Water by Linda Sue Park. 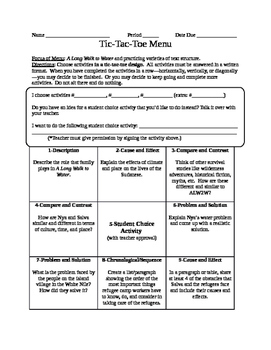 Students get to choose the activities, which are organized by types of text structure. Therefore, it can be a practice or review of text structure, or it doesn't have to have anything to do with text structure, you decide. Student answers may vary, do there is not an answer key included. Product is in document form to allow you to edit and make it your own. Please send any questions.